The Gouldian finch (Erythrura gouldiae John Gould 1944) is a bird belonging to the order of the Passeriforms (Passeriformes), family of the Estrildids (Estrildidae), genus Erythrura, species Erythrura gouldiae. This species has been initially sighted and seized during the first half of the 800 but its classification is to be ascribed to the English naturalist, painter, taxidermist and ornithologist John Gould who dedicated the name of the most beautiful bird he had seen in Australia to his dead wife. John Gould sojourned in Australia with his wife Elizabeth, from 1838 to 1840. 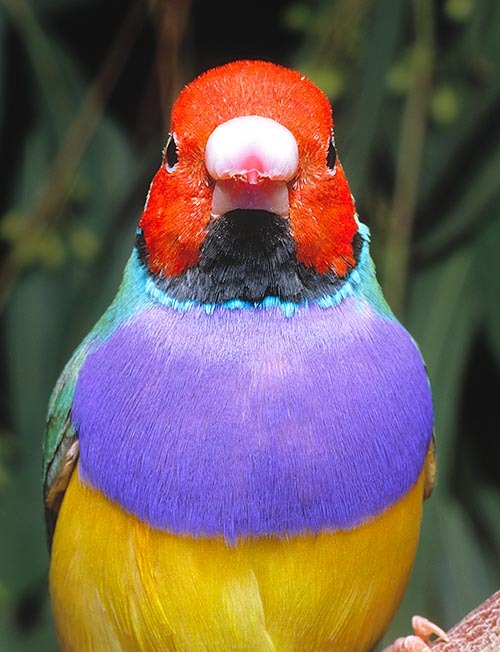 John Gould’s wife passed away just during the return trip from Australia and the wonderful birdie was named, by the husband, in his honour, “Lady Gouldian Finch”. The name of the genus Erythrura comes from the Greek “eryhtros” which means red and from “ura”, meaning tail. This genus includes species of small granivorous birds which, due to their bright and lively colours are called “Rainbow finches”; however, not all species have red tail or rump as indicated in the nomenclature of the genus; among these stands also the Gouldian finch which has black tail and light blue rump. This unique passerine is native to the Australian continent where it is distributed in a piecemeal way in the northern part of the continent from the Peninsula of Cape York up to the region of Kimberley; in the wild it is present with three colour variants; the one counting the highest number of specimens is the “red faced”, there is then a “black faced” form and the least diffused one, the “orange”. Inside their distribution ranges, the Gouldian finches are erratic as they move looking for food and water. Usually such displacements are rather limited in their distances. This species loves the savannahs and the prairies where normally it moves in vocalizing groups, to emphasize their own sociable and lively nature, looking for seeds of various types and of small insects. The flocks moving together with other species such as the Masked finch (Poephila personata) and the Long-tailed finch (Poephila acuticauda) spend most of their time on the ground looking for food. The zones where they nourish are abandoned only when the food or the water become scarce. The Gouldian finch is a small bird, about 12-15 cm long, with an unmistakable livery thanks to the set of colours characterizing it and which recall the tonalities present in the rainbow. Its shape is that of a typical granivorous passerine with robust and stocky beak, in its whole it has a look massive, but slightly elongated and aerodynamic in the same time. The garish colouring is subdivided as follows: the back, the wings and the nape are green which becomes paler and brighter in the zone of the neck. The chest, wide and prominent, is of a wonderful intense violet, the belly is canary yellow, the under tail and the lower belly are white. The head has a red mask from the base of the beak up to some millimetres after the eye (of brown colour), this red mask has a black border extending in a lower flap which reaches the base of the beak and presents as pink coloured with reddish apex (more intense when in “heat”) in the male. The beak is greyish in the female. There are even some parts of a luminous light blue; of such colouration are, in fact, the rump (dorsal part of the tail) and a second border of the head uniting the black one with the beginning of the green of the nape-back. The tail is black and has, as an average, two elongated rectrices, longer and filiform only in the mature males. The legs are flesh-coloured and of the same colour is the very thin ring of bare skin placed around the eye. The female is much similar to the male and apart the differences already indicated presents, usually, less bright colours, the skin is of a violet-mauve colour and the facial mask is less expanded. As already said, there are other two variants of wild colourations: one with totally black mask where at the place of the red is rightly present the black which becomes one with the black border and throat and another one, even less diffused, where the mask instead of being red has an orange-yellow colour. The immature young have head, sides, neck and lower parts of greyish-brown colour and the back, the wings and the tail of olive green colour. This bird, rightly for its beauty, has been and is so much bred in domestic habitats that the breeders have created a huge variety of mutations of colour interesting one or more parts of its livery. The pairs which start their reproductive activity tend to isolate by early February, when the seasonal temperatures do not drop under the 20 °C and do not increase beyond the 30 °C; in this time the rains are abundant and consequently the food becomes more available due to the luxuriant growth of the vegetation. The nest is mainly built by the female, with vegetal material of various type (small branches, blades of grass, leaves), inside a cavity of a trunk or in the tangle of the branches of a tree or of a bush full of foliage. The nest is rather elaborate and when it is totally built (outside a cavity) it is spherical with an entrance hole. Inside, the hatching chamber, which may covered by feathers or hairs, presents well structured and comfortable for the brood. The typical brood consists in 4-6 white eggs which both parents, mostly the female, brood for about 13-14 days. Many newborns of birds, nidicolous and inept, have beaks and fauces having bright colours (usually yellow-orange-red) which, once wide open, while asking for food to the parents or to whomever, indicate clearly the mouths well open favouring the feeding and stimulating the same; the newborns of Gouldian finches have 4 light azure-bluish protruding and phosphorescent papillae which render visible in the semi-darkness of the nest the fauces by brightening on the two sides of the beak (two for each commissure). The effect of these luminescent “beads” joined with a series of black points present on the palate and on the inner base of the beak render the nourishing so much tempting that often the Gouldian finch, when in captivity, has been and is bred by other species of granivorous passerines used, therefore, as foster nurses. These papillae will disappear when the young will be about 40-60 days old, time when they will reach the independence beginning to feed in an autonomous manner. The Gouldian finch upon its birth is about 1,5 cm long and is implumed and inept and will stay in the nest till the age of 20-30 days; the adult livery will come when about 3-4 months old and with lifespan of 10-12 years. 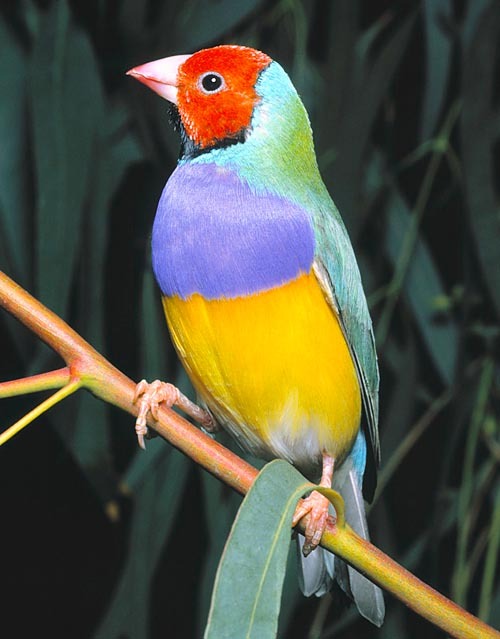 Unluckily, the wild populations of Gouldian finch have undergone a strong reduction during the twentieth century due to pathologies to which this small bird seems to be particularly susceptible and due to the alteration, done by the humans, of its own habitat such as, for instance, the high number of criminal or of negligent fires. On the other hand, the vast diffusion of this bird in captivity has saved the species from the extinction even if it would have been desirable that the breeders would concentrate also and especially in the breeding of the three morphological forms present in nature rather than in the breeding and the creation of artificial absolutely of no use and even counterproductive from the point of view of the conservation.